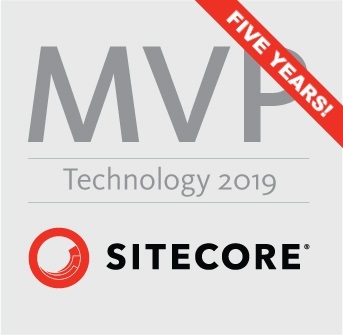 So what are Sitecore providing? When you look at the packages in that feed, there are quite a few. Sitecore have built a tree-like structure that goes from top level “meta packages” down to individual DLL packages. This gives you a lot of flexibility about exactly what you want to reference, but it can make the initial list a bit intimidating. Don’t worry though – it’s all pretty logical. 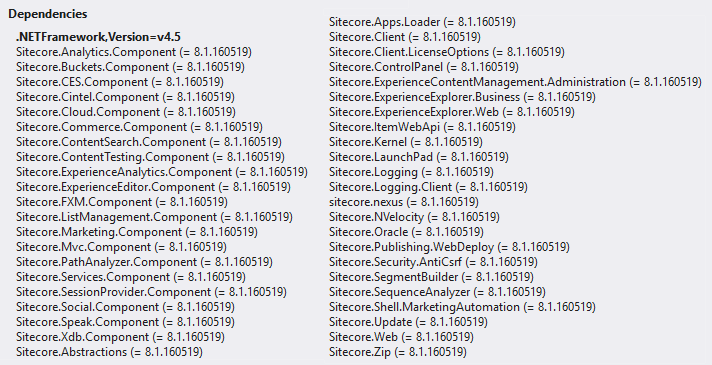 Note that not all of these are packages created by Sitecore: The Newtonsoft.Json package is included here. 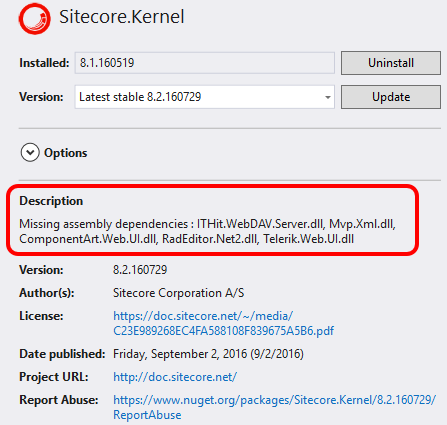 According to their documentation, Sitecore have included standard Nuget.org references to third party packages where they are available. So you can copy these out of your /bin folder and reference them by making your own private package, or whatever other way suits your solution best. 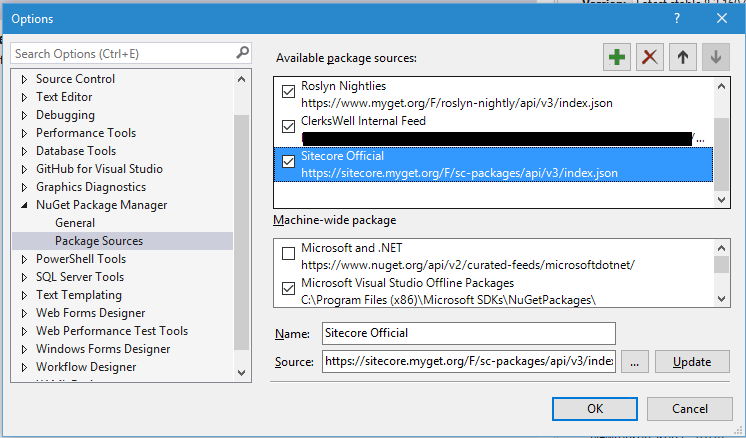 Now, if you search through the contents of Sitecore’s NuGet feed, you’ll notice that there are a collection of packages with names that have “.NoReferences” at the end. For example, there is a Sitecore.Analytics.NoReferences package as well as the Sitecore.Analytics package mentioned above. What’s that all about? Simple – the .NoReferences packages include the binary files but don’t have dependencies on other packages. So if you want to pick out individual DLLs without having to import all of the other assemblies that file depends on, choose these packages. It’s a bit more effort to manually add each of these that you need – but it means your project only refers to the specific files you want. My gut feeling is that these are probably the packages you want most of the time – since most Sitecore development is “I am writing some code which depends on Sitecore” – you only need to include the assemblies that your code actually depends on at compilation time in your solution. All the other assemblies which are required to actually execute code will be available when you deploy – since they’re in your website’s /bin folder. Another point made in the documentation, is that these packages don’t adjust the “copy local” flag when they’re added to your solution. You may wish to change this property on your referenced DLLs manually where it’s appropriate. So once you’ve added the right settings to Visual Studio / NuGet.config to be able to resolve theses packages, what do you need to do to a solution to make use of the feed? Simple really: just remove your old references and add the new ones from Sitecore’s feed. This one’s simple enough. You just have to add the references for whatever your code depends on. 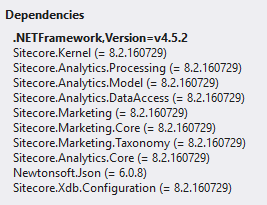 For the code I was writing, that was just Sitecore.Kernel.NoRefrences. Though you may find it’s easier to use packages that include the references – it all depends on the complexity of your project I think. The reference requirements for FakeDB are described in the installation instructions. So you can add Lucene.Net from the ordinary NuGet feed, and then the .NoReference packages for the remaining four assemblies. You may also need to add any other dependencies your code has, as per the code project bullet above. One thing to note here, as you’re adding lots of different packages. Slightly annoyingly, the NuGet reference dialog always defaults to the latest package version when you select a new package. So if you’re not trying to install packages for the v8.2 release, you need to remember to check you’ve picked the right version every time. One minor oddity I noticed – the Sitecore.Nexus reference comes in two different packages. There’s one for the v7.x and v8.1 versions and one for the v8.2 version. Take care to pick the right package if you need to add a reference for that. Working through all of this, I noticed an odd side-effect of using multiple package sources in Visual Studio. If you add a private feed (which requires authentication) to your solution, then you’ll get prompted for credentials whenever Visual Studio needs to connect and doesn’t have a valid credential to hand. Oddly, if your authentication fails or is cancelled for any private feed, you cannot restore packages from any feed (authenticated or not) until you resolve the credential issue. And sometimes that involves closing and re-opening Visual Studio. Hey Jeremy, quick tip for the authenticated feeds niggle: if you grab the command line nuget.exe you can then use the `add source` or `modify source` verbs to persist the credentials (encrypted by default) in your nuget.config. That’s interesting – I shall have a look into that. Cheers! as I got a 404 error when trying to add a package from the Sitecore source with the full URL provided above. Ah – you’re using an older version of NuGet I expect, so you need the feed for older API. Thanks for this wonderful tutorial. when we publish, does it copy those references? NuGet references have the same behaviour as other sorts of DLL references – the copy-local settings and publishing still work the same way. So you can choose if these DLLs get published or not.